Nancy Thompson Mahler, our founder/president just returned home from a six week stay in Fiji. She spent a few days on the big island Viti Levu in Suva. Most of her time there was spent in meetings, picking up supplies and meeting with friends. Nancy and Ben Sorensen, our project manager, also attended the Rotary Club of Suva North. Rotary has been a generous supporter of our projects. While in Fiji, Nancy and Ben met with the Director of Immigration, Nemani Vuniwaqa, the Divisional Medical Officer, Dr. Dave Whippy and Deputy Secretary of Public Health, Dr. Josefa Koroivueta. We feel confident that Wananavu Kadavu Inc. will be working in Fiji for many years. Most of the time in Fiji, Nancy spent on the island of Kadavu, visiting Navuatu/Drue Villages and seeing old friends. 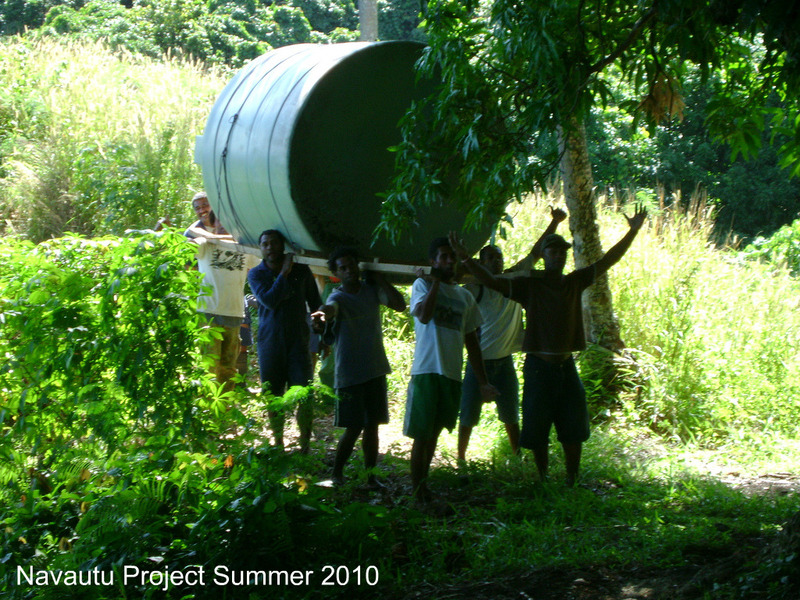 Nancy hiked up to the Navuatu water project completed by Wananavu Kadavu last year, with Vilive Cula, Mojo and Epi. They walked ahead of her so they could use their machete to clear the path. Everything on the project looked good and the system was working without problems. In the beginning we wanted to do both the Navuatu and Drue Villages, but because of unforeseen road blocks, we were only able to work in the Navuatu Village. While visiting this year, many people from both villages asked if and when we could add Drue to our existing spring/tanks. Wananavu Kadavu hopes that in the near future we will return to Drue to do this work. Until then, the community building used by both villages has a spout where everyone can get clean drinking water. The people of both Drue and Navuatu were very thankful for our efforts. It was very rewarding to receive such a warm welcome from both Drue and Navuatu. While in Navuatu/Drue there were tsunami warnings, a 4.5 earthquake and cyclone warnings. The weather may not have been sunshine all day, but it was always warm and beautiful. Nancy thought that it just added to the adventure and she knew she was among friends. During her stay in Kavala Bay, Nancy stayed with her son Ben, our project manager. Ben has been working in Fiji with Wananavu Kadavu since the summer of 2009. She said it was especially nice to meet with the men and women who have and will continue to work with Ben from start to finish. There are two men who work with Ben every day, Joseva Delana and Rato Cavei Saqeta. These men, along with many other men from the surrounding villages, have been instrumental in making this project at the Kavala Health Clinic possible. Hiking up to the projects was very humbling. When meeting with officials in Suva, Nancy was asked if she really hiked up to each project. Her answer was "if these men can hike up with 120 lbs bags of cement on their backs, I can do it holding my camera". Many pictures were taken, lunch was a papaya shared with everyone and tears of gratitude flowed freely. It truly is a community working together. It was a joy to see the contributions and support of so many coming to fruition. Nancy and Ben also visited several neighboring villages and resorts on Kadavu and Ono. The purpose of these visits was to give information about our projects and leave literature for any visitors wanting to be a part of this work. They visited Matana Beach Resort, Dive Kadavu; http://www.divekadavu.com/, Matava- The Astrolabe Hideaway; http://www.matava.com/ ( while there they met travelers from their home state of Utah, USA ) and Waisalima Beach Resort & Dive Centre; http://www.waisalima.com/. Next, on the island of Ono, they spent time at Mai Dive- Astrolabe Reef Resort; http://www.maidive.com/blog. All amazing resorts with delicious food, beautiful music and friendly people. The last stop was Oneta Resort; http://onetafiji.com/. While at Oneta, they meet tourists on a fishing trip from Australia who were celebrating a fortieth birthday for one. These men were very interested in our projects and had great ideas to share. The owner, Piero Piva invited Nancy and Ben back the next day for dinner, and a farewell lovo with music and dancing with their new friends. At the end of the night they were treated to a nights stay and beautiful breakfast before heading back to Kavala Bay. Before leaving Kavala Bay, Nancy had the opportunity to meet Rato Irinale Soqeta, father to RT Cavei and his family. RT Irinale is the Chief of the Nakasaleka District. He presented Wananavu Kadavu with a beautiful hand carved Kava Bowl in appreciation of our work in Fiji. Kava is a mildly intoxicating drink, the preparation of which involves elaborate ritual procedures when used in formal ceremonies where it plays an important part. The Kava is served from these bowls. Other ceremonies of farewell were given. The Navuatu Village presented our organization with a beautiful conch shell. The conch shell is customarily used as a horn by native Fijians to call people for meetings, church services and warnings. We are so grateful to have the opportunity to work in Fiji. Boarding the big ship, Suni-I-Wasa for Nancy's return to Suva was an experience to remember. Being her first ride on a large ship, she wasn't sure what to expect. Nancy says mingling with friends and passengers was a sweet goodbye. The crew of the Suni-I-Wasa were especially kind and generous which made the trip so enjoyable. They even invited Nancy on to the bridge to steer the ship. All arrived safely. Back in Suva, Nancy and Ben were able to spend time with Dr. Russell Howorth, the Director of SOPAC and member of our advisory board. They also met with Garry Yost, Managing Director of ECO Energy Solutions. We thank you to all for your great wealth of information and support. We couldn't do it without you. We have learned that natural resources and agriculture are not a problem in Fiji, the land is rich and beautiful. Fiji is a wonderful country, a paradise with some of the most hospitable people in the world. You will always be greeted with a warm welcome of Bula. Natural resources include timber, fish, gold, copper and hydro-power to name a few. Agriculture products include sugarcane, coconuts, cassava (tapioca), rice, sweet potatoes, bananas; cattle, pigs, horses, goats and fish. Industries include tourism, sugar, clothing, copra (dried meat, or kernel, of the coconut), gold, silver, lumber and small cottage industries. Fiji also has the best water in the world. We know that because it's sold around the world in handy bottles. 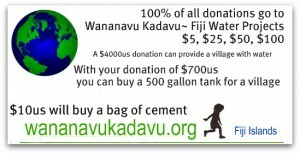 So why is Wananavu Kadavu working in Fiji to bring clean drinking water into rural villages, clinics and schools? Unfortunately, many people in rural areas of Fiji do not have a reliable source of clean drinking water. The issue is water access rather than water availability, since Fiji is an aquifer-rich country and much of its clean water supply lies underneath the surface. Fiji has numerous small islands, some of which are low in elevation. Surface water availability is a problem in some islands, which rely on groundwater. Some have been able to use rainwater catchment, others don't have the money to buy needed materials. Many people in Fiji do not have the resources needed to bring clean water where its needed most. In many rural villages, they are often using runoff from rivers and streams resulting in many illnesses. Wananavu Kadavu has been working on the island of Kadavu since the summer of 2009. We are fortunate that Kadavu is mountainous, which allows us to use a gravity fed water system to bring water to needed areas. Our projects so far are the Nuku Settlement, Navuatu Village and the soon to be completed Kavala Health Clinic at Kavala Bay. This project will serve nearly 1/3 of Kadavu's population. We have numerous villages, schools and clinics asking us to come to their village. Working with the Fijian Government has been a great opportunity for us. The Prime Ministers Office, Immigration, the Health Ministry and others have been great supporters of our work. Vinaka vacalevu to you all and may we have many more years working together. We are grateful to our supporters from around the world and those who have donated to this great cause. Water is life. We will be holding our 2nd Annual Wananavu Kadavu Golf Tournament on Monday, August 1, 2011 at the Valley View Golf Course in Layton, Utah. 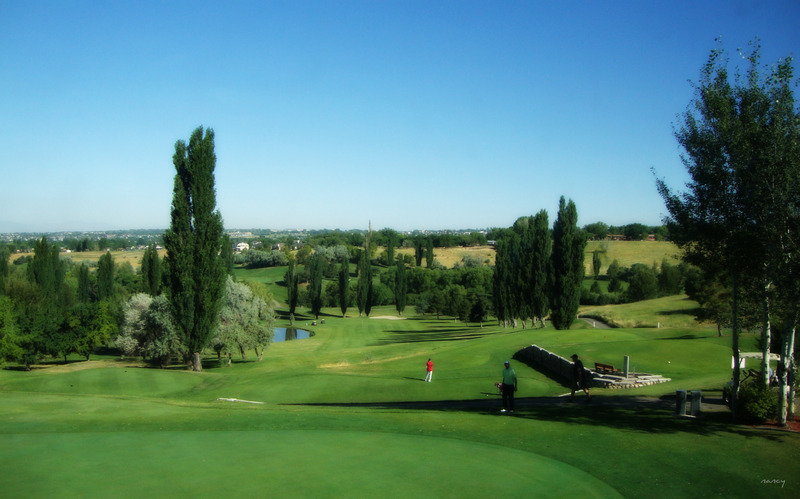 We'd love to have you join us for a day of golf, good food and fun. If you'd like to be a sponsor, volunteer or make a donation please contact us by phone or email. Soon Nancy Thompson Mahler the founder/president of Wananavu Kadavu Inc. will be traveling to Fiji to check out the progress on the Kavala Health Clinic.The Clinic is located; Nakasalenka, Kadavu, Fijian Islands. While in Fiji Nancy plans on attending Rotary meetings with our project manager Ben Sorensen. Meeting with various people about upcoming projects, seeing old friends and meeting new. Working at the Clinic has been a pleasure for Ben. Together he works with three differnet villages, and just like the two before he feels right at home. Here are just a few photos of the project taken by Ben. When Nancy returns back to Utah we'll have many more to share with you. fresh spring water to rural villages in Fiji. you're helping bring fresh drinking water to rural village in Fiji.